Despite serious safety and security issues, the Federal Energy Regulatory Commission (FERC) issued approval for Spectra Energy’s Algonquin Incremental Market (AIM) Project on March 3, 2015. Spectra’s project includes the installation of a massive 42-inch diameter high-pressure pipeline 105 feet from vital structures at the Indian Point nuclear facility, in a seismic zone. Unless something is done, construction could start soon. Although this location of the pipeline poses a dire threat to the 17 million people who live in the area and NYC, this critical issue has not been adequately addressed in the press. Most people are unaware of the project, the unacceptable risks to the region and its grave health and safety issues, as well as the glaring deficiencies in the FERC approval process. Unless New Yorkers and others with influence know about the potentially catastrophic risks of this unnecessary project, it may very soon become a reality. 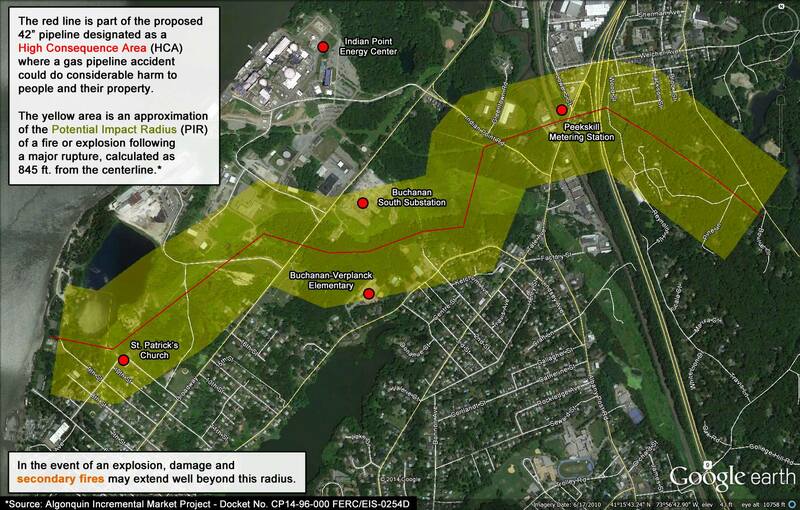 Map of Potential Impact Radius of 42″ pipeline adjacent to Indian Point Energy Center. Map based on route indicated in Spectra Energy FERC filings from February 2014. Nuclear expert Paul Blanch and pipeline expert Richard Kuprewicz of Accufacts raised major concerns about the methodology used to assess failsafe shutdown of Indian Point in the event of a pipeline rupture. The plant operator, Entergy, conducted a hazards analysis that was accepted by the Nuclear Regulatory Commission (NRC) and formed the basis for FERC’s approval of the AIM project’s siting at Indian Point. Mr. Blanch believes this conclusion is based on the unsubstantiated and unrealistic estimate that the gas valves could be closed in three minutes. The three minute valve closure estimate from Entergy was accepted by the NRC engineer responsible for the NRC’s gas line analysis for Indian Point. 2. None of the cited references mention 3 minutes for a gas line rupture but do discuss a 1-hour time to be considered. History and expert opinions demonstrate gas blowdown times range from 30 minutes to many hours. 3. Using more realistic gas release of one to two orders of magnitude greater, the blast radius would encompass the city water tank and possibly tanks used for core cooling. The NRC/Entergy analysis stated the switchyard and the diesel oil storage tanks are within the blast radius. Loss of the switchyard and the oil tanks would result in a station blackout (SBO) and the loss of the city water tank would render the Unit 2 SBO diesel inoperable due to loss of SBO diesel generator cooling. 4. The city water tank serves to supply back-up water to the Auxiliary Feedwater System used to cool the core during loss of AC power/SBO event. 5. The NRC stated in its analysis that the probability of an explosion after a pipe rupture is 5% yet this number is not contained in any of the cited references. Research shows almost 100% of pipe ruptures result in ignition. 6. The NRC analysis assumes that a total pipe rupture will occur in 1% of the pipeline accidents whereas the references clearly state this occurs in 20% of the accidents. 7. The NRC analysis states: “If this release is due to the underground pipe, the frequency of explosion will be further reduced by at least an order of magnitude.” (Emphasis added) There is no documentation or reference supporting this non-conservative assumption. 8. The analysis for the COLA permit for Turkey Point nuclear plants Units 6 and 7 in Homestead Florida predict a damage radius of more than 3000 feet from a smaller line gas operation at a lower pressure. The NRC/Entergy analysis predicts a damage radius of 1155 feet for the proposed Spectra AIM pipeline in Cortlandt, NY, more than double in capacity operating at a higher pressure. 9. The cited reference “ Handbook of Chemical Hazard Analysis Procedures ” is apparently dated circa 1987 and does not consider subsequent major gas-line explosions such as the San Bruno, CA, Sissonville WV, Cleburne TX, Carlsbad NM, and the Edison, NJ transmission and distribution explosions. Senators Charles Schumer and Kirsten Gillibrand, Congresswoman Nita Lowey and Attorney General Schneiderman’s office officially expressed their concern about the enormous risks from the proposed expansion in letters to the Chairwoman of FERC. Thousands of residents of Rockland, Westchester and Putnam counties, and local, county, state and federal elected officials called on involved agencies and FERC to refrain from granting approval until an independent, transparent and comprehensive health and safety assessment had been conducted that fully engages all stakeholders in the process. – There are alarming rates of unintended gas pipeline failures. According to the U.S. Department of Transportation’s Pipelines and Hazardous Materials Safety Administration, there were 119 incidents in gas transmission pipelines in 2014. – In 2014 a 2.5 magnitude earthquake occurred just 10 miles from Indian Point which has the highest risk of earthquake damage of any nuclear power plant in the country. (In spring 2014 the NRC called for an earthquake evaluation which hasn’t been done). – In addition to the potential of an accidental rupture near Indian Point, there is a possibility of an intentional explosion in the pipeline. Indian Point is a known terrorist target. Since comments on the DEIS by Attorney General Schneiderman’s office in September, Governor Cuomo’s office has remained silent on the matter. In response to that letter, the DHS stated that the NRC is the agency responsible for ensuring the safety and security of commercial nuclear power plants. However, the NRC’s review relied on information provided by the power plant and the pipeline company. ignored its own guidance and sought out another, prohibited methodology to obtain the desired outcome. FERC. Additionally, our Senators and Congressmembers must demand that FERC and the NRC withdraw their approval of the AIM project based on the lack of substantive verification of the failsafe shutdown timeframe. A full, transparent, independent risk assessment must be undertaken as soon as possible. The scale of impact of a “Fukushima on the Hudson” on the New York City area and the economy of the United States makes it beyond comprehension why FERC, Homeland Security, the NRC – or any government agency – would even consider putting a pipeline next to Indian Point.